Liquid soap is in. Different brands of liquid soaps are seen in grocery stores and supermarkets, yet which of it will you buy? 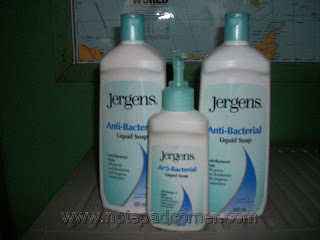 Do you know that Jergens Antibacterial Liquid Soap is an all in one soap not only for you but for your family too? It kills germs, deodorizes and moisturizes as well. Years ago, my ob-gyne recommended it as an alternative to my intimate wash. I gave it a try and satisfied with it. I’ve been using it for years now. During the cold weather, we use it for body wash to moisturize our skin and prevent it from drying. 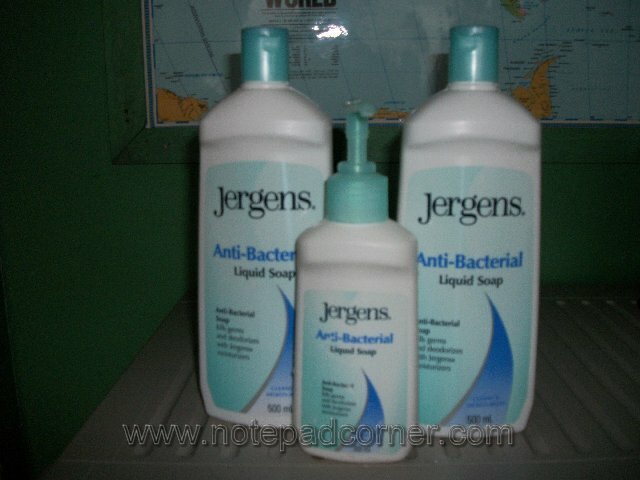 I place bottles of Jergens in the bathroom/comfort room and another one in the kitchen. It is also very effective as a hand wash. It gently removes stubborn odors, like garlic for instance. It is very affordable and could last a long time, depending on the usage. A pea size is enough for hand washing and in intimate washing. It comes in a big bottle for refill and a small one with an easy dispersal cap. Di ko pa na-try yan Joy..hmmmnnn.. I'll try it nga..
hi, joy. visiting from the bloggers exchange. I didn't realize Jergens has a liquid soap. I can't find any of that here in Dubai. Baka pag-vacation sa Pinas, I'll buy some to take back home. I normally use the Bath and Body Works na Anti-bacterial liquid hand soap pero if there is something cheaper and smells good too, siguro I'll try that brand. It's 3 in 1, for body, for hair, and for shaving. They should have made it 4 in 1, for body, shampoo, shave and toothpaste. Parang wala akong nakikitang ganyan dito. Willa, welcome back sis! you're my top commentator, thanks for the support and frequent visits, wag ka magsawa ha, i will always wait for you hihi.